TAMIL NADU FOREST UNIFORMED SERVICES RECRUITMENT COMMITTEE (TNFUSRC), Has Recently Published A Recruitment Notification For The Post Of Forest Watchers. So Interested People Can Apply To This Job Through Online Mode From May 1st Week Onwards. 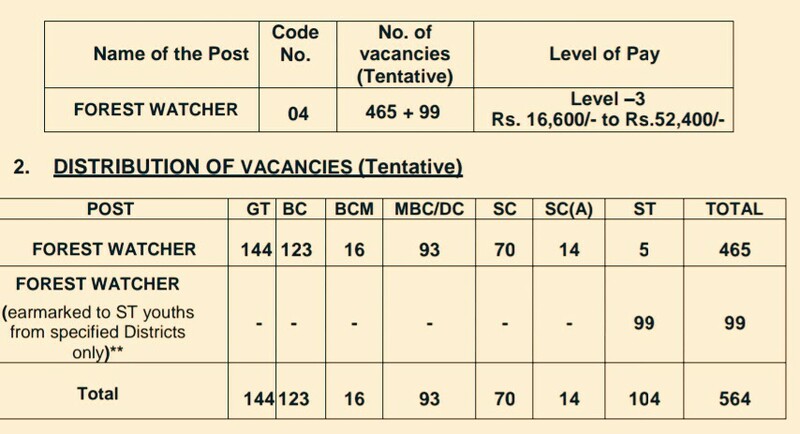 Forest Watcher →564 Vacancies, Kindly Do Check Out The Image Below For Vacancies Distinction, Pay Scale & More. (Credit- The Official Advertisement No. 1/2019). B. Eligible Criteria For Forest Watcher Job Vacancy In TNFUSRC Recruitment Notification 2019. Age Limit →21 To 30 Years As On 1st Of July, 2019. Educational Qualifications →Must possess Minimum General Educational Qualification viz., Must have passed S.S.L.C Public Examination or its equivalent with eligibility for admission to Higher Secondary Courses of Studies (or) to College Courses of studies. Mode Of Examination/Selection Process →Based on the Online Examination, the eligible (successful) candidates will be called for appearing in Certificate Verification, Physical Standards Verification and Endurance Test in 1:3 ratio for final Selection. Online Application/Examination Fee →₹150 + Services Charge. Last Date For Online Application Form Submission →3rd Week Of May, 2019. For More Info→The Official Website. Now Apply For Forest Watcher Job Vacancy In TNFUSRC Recruitment.